Tobacco firms are facing a ban on all branding on cigarette packets after the Government signalled its support for plain packaging. Ahead of a public consultation over the matter, Health Secretary Andrew Lansley told The Times newspaper that attractive packaging entices smokers to buy cigarettes. The coalition is due to launch a consultation over plain packaging for cigarettes on Monday. Mr Lansley insisted he was "open minded" about the consultation, but added: "We don't work in partnership with the tobacco companies because we are trying to arrive at a point where they have no business in this country." Such a ban would be the latest attack on smoking after previous governments stopped tobacco companies describing certain brands of cigarettes as "lights" and outlawed sponsorship deals. Cigarette firms were also forced to publish on packets graphic, gruesome images of cancerous organs and stark warnings about the potential health effects of lighting up. Strongly opposed to any ban on branding, British American Tobacco said Mr Lansley's desire for tobacco companies to have no business in the UK was "naive". The firm said: "Plain packaging will be easier for criminal gangs to counterfeit and children are more likely to buy cheap, dodgy cigarettes on the streets than adults. "People know the health risks but still choose to smoke. "Undermining the legal tobacco industry will only make more space for the illegal, unregulated black market - a very dangerous move." Chancellor George Osborne announced in last month's Budget that the price of a packet of 20 cigarettes would rise by 37p, taking the average cost to £7.36. Mr Lansley's latest comments came a week after a ban on tobacco promotion in England came into force. New laws mean all large shops and supermarkets must cover up cigarettes and hide tobacco products from public view. The Department of Health (Euronext: IXSHL.NX - news) said the move was in response to evidence that cigarette displays in shops can encourage young people to take up the habit. More than 300,000 children under 16 try smoking each year and 5% of children aged 11 to 15 are regular smokers, according to its figures. Welcoming the prospect of branding being removed from packaging, Deborah Arnott, chief executive of campaigning charity Action on Smoking and Health, said it would put the UK "in pole position to be the first European nation to put tobacco in plain, standardised packs". "Cigarettes are not like sweets or toys and should not be sold in fancy colourful packaging which make them appealing to children," she added. But pro-smoking group Forest, the Freedom Organisation for the Right to Enjoy Smoking Tobacco, has launched a Hands Off Our Packs (Hoops) campaign. Director Simon Clark described plain packaging as "the persecution of a minority lifestyle choice". 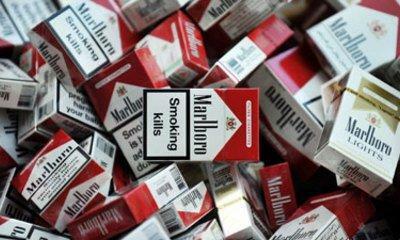 He said: "Plain packaging is yet another attack on retailers and adult consumers. "People are sick of being nannied by Government." Mr Lansley dismissed claims that smoking could become more attractive to young people if it was hidden and insisted the key issue was about "shifting the culture". He said the ban on displaying cigarettes was part of a move to ensure "we no longer see smoking as a part of life". But Tory MP Mark Field warned that any ban would increase smuggling and deny the Treasury much-needed cash. He said the Treasury was already losing around £3bn a year from tobacco that has evaded UK duty through criminal gangs. "All of this could result in a potential loss of investment and jobs that goes way beyond the tobacco manufacturing sector," he added. New data from Cancer Research has revealed rising numbers of women dying from lung cancer, with the disease now affecting 39 in every 100,000 women, compared to 22 in every 100,000 in 1975.